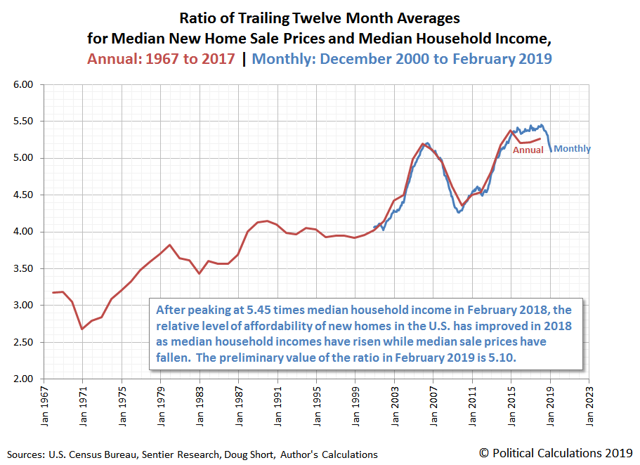 The combination of falling median new home sale prices and rising median household incomes in the United States has resulted in a sharp decline in the relative unaffordability of new homes since the ratio between the two peaked in February 2018. 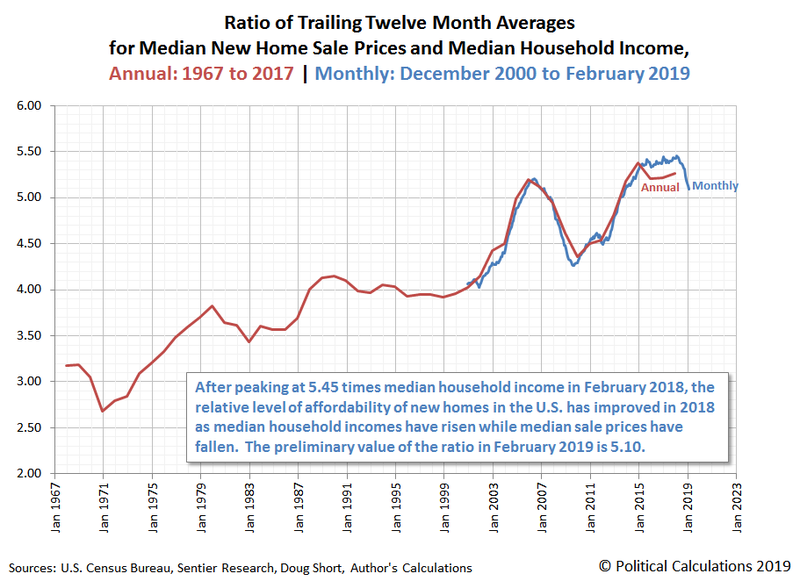 After peaking at 5.45 times median household income in February 2018, the relative level of affordability of new homes in the U.S. has improved as median household incomes have risen while median sale prices have fallen. The preliminary data for February 2019 puts the raw figure for median new home sales figure at $315,300 and its trailing twelve-month average at $319,417. The following chart shows the history of the ratio of trailing twelve-month averages of median new home sales prices and median household income for annual data from 1967 through 2017, and for monthly data from December 2000 through February 2019. Here, we see that after peaking at 5.45 times median household income in February 2018, the relative level of affordability of new homes in the U.S. has improved as median household incomes have risen while median sale prices have fallen. The preliminary value of the ratio in February 2019 is 5.1, which is still well-elevated in historical terms. Looking at the underlying data, we find that median new home sale prices in the United States spiked to a peak value of $343,400 in November 2017. When we track their trailing twelve-month average to smooth out month-to-month volatility in the data, we put their peak at $326,683 in April 2018. The preliminary data for February 2019 puts the raw figure for median new home sales figure at $315,300 and its trailing twelve-month average at $319,417. These figures will be revised three more times during the next several months until they are finalized. Through all this time, median household income in the U.S. has generally increased, rising from $60,089 in November 2017 to $61,483 in April 2018 to $63,378 in February 2019, with the trailing twelve-month average for this data series increasing from $59,105 to $60,083 and on to $62,687 over the same interval of time. 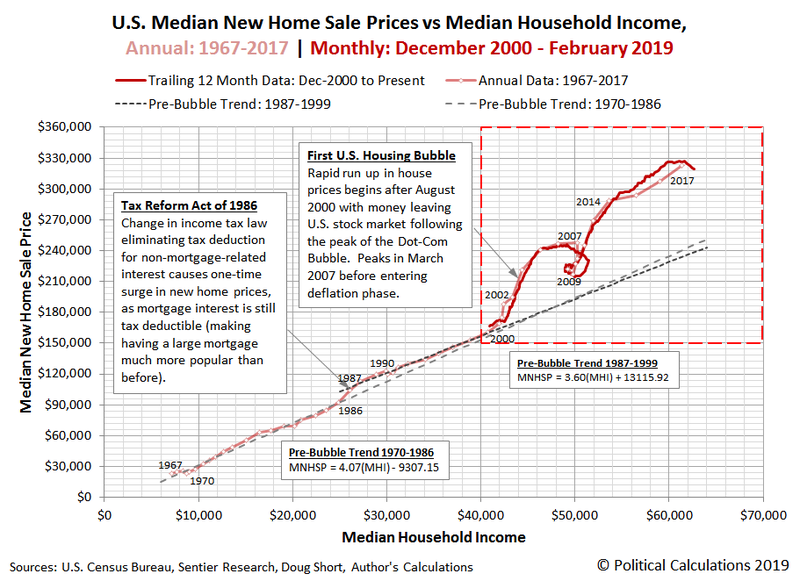 The following chart presents the relationship between trailing twelve-month averages of median new home sale prices and median household income from December 2000 through February 2019. 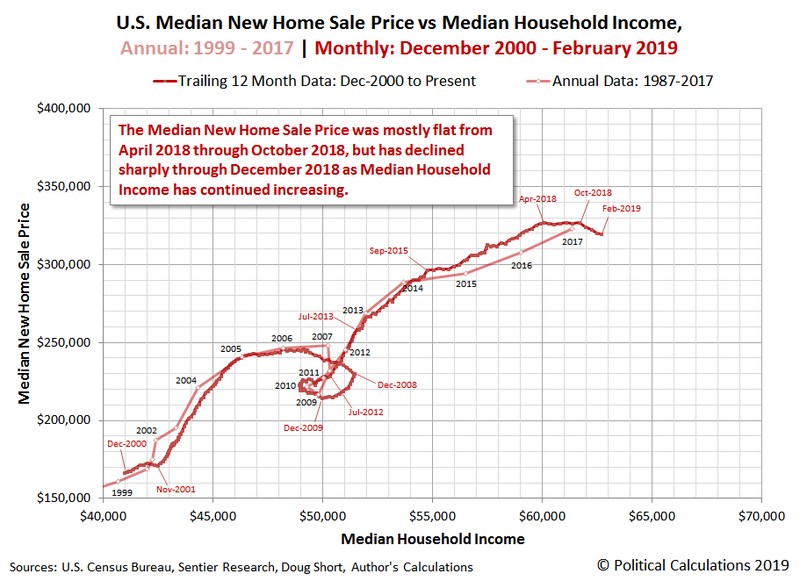 Historically speaking, the recent trends for the relationship between median new home sale prices and median household income is similar to the early deflation phase of the first U.S. housing bubble after 2005. Our next chart shows how these recent patterns compare to the longer-term historical trends for these data series, with annual data that extends back to 1967. U.S. Census Bureau. Median and Average Sales Prices of New Homes Sold in the United States. [Excel Spreadsheet]. Accessed March 29, 2019.